Ceramic Knives are the new way to prepare food safely and healthily and these sets of Pink Ceramic Knives provide the ultimate in sharpness and design. Each set has been put together with your home and workplace in mind. Professional chefs recommend Ceramic Knives for food preparation. Our stylish designs, using the chequered black and white on the blade with a pink coloured coated soft grip handle will surpass all expectations. Whether they are a gift for a friend or loved one, a wedding or an anniversary, these kitchen knives will form a focal point in the kitchen for years to come. Each knife has been designed to stay sharp without any need for sharpening, dishwasher proof and easy to wipe clean, these knives are a gift that keeps on giving. 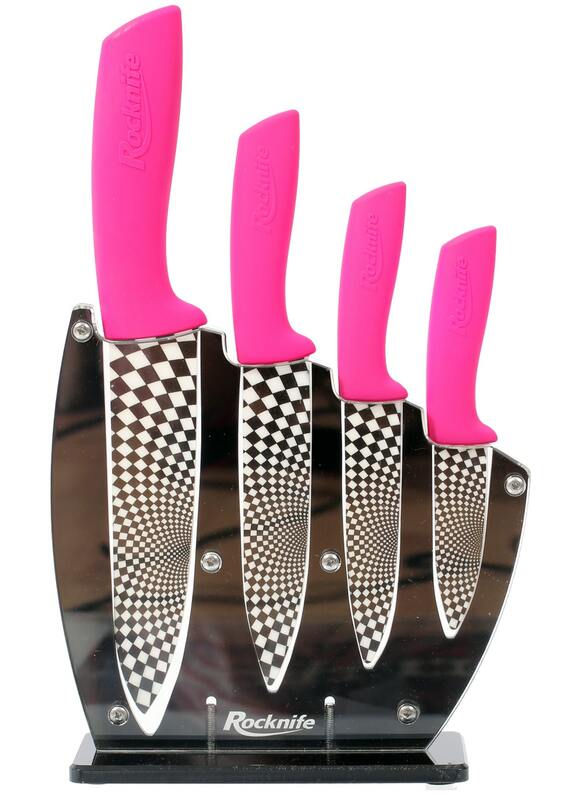 These bright pink sets are suitable for all fun loving, vibrant and colourful kitchens, making them ideal if you don’t want to misplace your kitchen knives, a colour to stand out and be enjoyed by one and all. All our Ceramic Kitchen Knife Sets come with a Free stand, meaning that your knife set can be free standing on your kitchen counter or wall mounted (screws included) for easy reaching and keeping them safe from little children’s hands. Please note that the orientation of the stand screws may differ from as shown on website photographs.